Starting from the town hall square of Corovode go along the dirt road that goes up the river Skrapar that crosses the country. 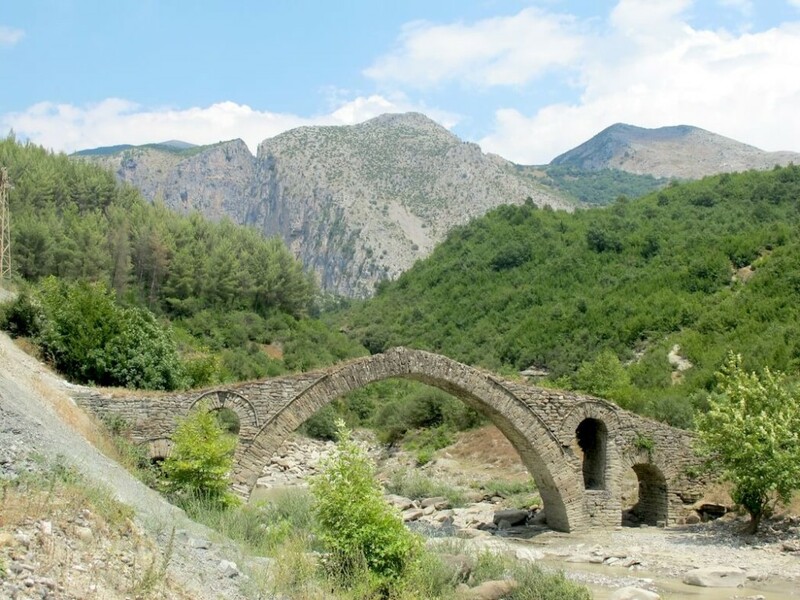 After 1 km you reach the stone bridge of the Ottoman era, and this begins to admire the canyon and the river valley. To his left are the inputs of an underground storage facility in the communist period still used by local people as a food warehouse. Continuing along the river and after 1 km you pass on the right a military depot and continuing further 1 km you will reach a stone quarry. Make sure that it is not in place because they could use explosive without warning, especially do not leave any vehicle in the vicinity. From the quarry is a path that ends in fifteen minutes the door and straight to the cave and inside the canyon. The cave is very interesting, his full tour would require a couple of hours entering into their bowels insidiously and would also require adequate equipment, though the initial entrance is not difficult. It is suggested to bring a flashlight and it will be very exciting. At the end of the visit to the cave to Corovode on the same street, back to the stone bridge. On the opposite bank of the river two paths in opposite directions: one on the left leads to the peasant village of Veseshte and one on the right road that connects the dirt road in addition to connecting Veseshte back to Corovode. From the stone bridge Corovode there are about 6 km of sliding paths. If you want to go to Veseshte, the trail is more wild and requires fifty minutes’ walk away from the city. Along the canyon initially enjoy beautiful views and then through some fields devoted to pasture you connect to the paths that lead to a few scattered houses that make up the village. From Veseshte the dirt road road that leads to Corovode in an hour, passing a small pond on the right and along the last stretch of the two small watchtowers military one or two places to round shape of reinforced concrete one meter thick, the legacy of period of the regime of Enver Hoxa. Shortly after enjoying the view of Corovode now, there is a path to go down in the center of the country.